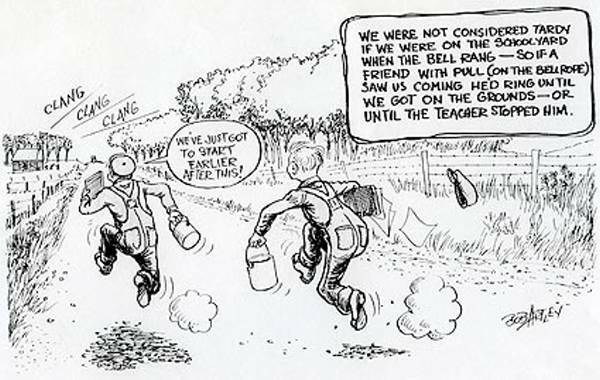 Bob Artley, known for his nostalgic cartoons about farm life in the 1920s and 1930s, died in Akron, Ohio on October 21. Artley had been living in an extended care facility. He was 94 years old. Artley was born George Robert Artley in the small town of Hampton, Iowa, in the north-central portion of the state. His family were farmers. He attended Grinnell College downstate before being drafted into World War II before the start of his senior year. He returned to Hampton after leaving the service, now married. He finished his college education at the University Of Iowa, where a lifetime love for drawing led to an editorial-cartoon gig at the campus publication The Daily Iowan. After university, Artley worked for a half-decade at the Des Moines Tribune, then at an advertising agency and as an art director for a publishing company. He moved back into the newspaper business first as a community newspaper editor/publisher and then as a cartoonist at the Worthington Daily Globe in the early 1970s. According to his obituary at the Globe Gazette (Mason City, Iowa) this was roughly the period in which he began doing his Memories Of A Former Kid cartoons, an escape from editorial cartoons and their politics and the work that would the dominant feature of his professional cartooning life moving forward. A 1978 self-published book, featuring dozens of Artley's drawn reminiscences of life on the family farm, proved so popular the Artleys sold additional printing rights to the Iowa State University Press in order to escape the obligations of fulfilling so many orders. In many ways, the Memories Of A Former Kid feature was reminiscent of a strong wave of nostalgic cartoons -- and prose works, including newspaper columns -- that appeared in the 1920s and 1930s of Artley's interest and focused on American life from 1870 to 1910. 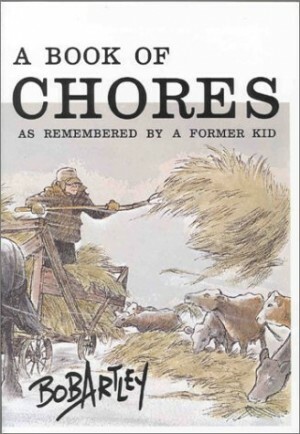 Artley's book collections, all from Iowa State University Press, included Cartoons: From The Newspaper Series Memories Of A Former Kid (1986), A Book Of Chores: As Remembered By A Former Kid (1989), A Country School (1989), Living With Cows (1996) and Country Christmas (As Remembered By A Former Kid) (1994). 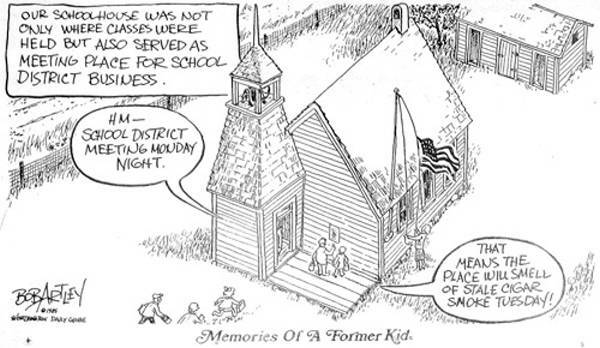 While Memories Of A Former Kid remained a feature of the Daily Globe, other regional newspapers carried it as well. Artley retired from from the newspaper in 1986. Artley was preceded in death by his wife Ginny in 1993. He remarried in 1995 to a fellow survivor of a spouse with Alzheimer's. They met when he wrote a book about losing his first wife in 1994, Ginny: A Love Remembered. The couple split time between Hampton and Florida. They eventually moved to Ohio to be near family. Many of Artley's cartoons were donated to Minnesota West Community and Technical College in 2007. A service for Artley will be held in Hampton, Iowa. He is survived by his second wife and three children.